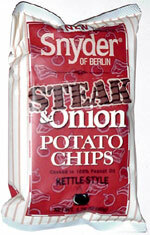 Taste test: These are some excellent steak and onion chips  that's really what they taste like! They've got lots of steak flavor, and even more onion flavor. Add to this the fact that Snyder of Berlin makes great kettle-cooked chips that have a really excellent crunch, and this chip's a major winner. Smell test: More oniony than steaky, but good. From the package: Ingredients include onion powder and “grill flavor.” What's grill flavor made of, you ask? According to the bag, “partially hydrogenated soybean and cottonseed oil, corn syrup solids, salt, toasted wheat germ and maltodextrin".